Orrville Red Rider Sports Blog: The House that Smitty Built?? Words can't describe how sweet this could potentially be. Alas, it's about as far-fetched (and far off) as field turf at Red Rider Stadium. 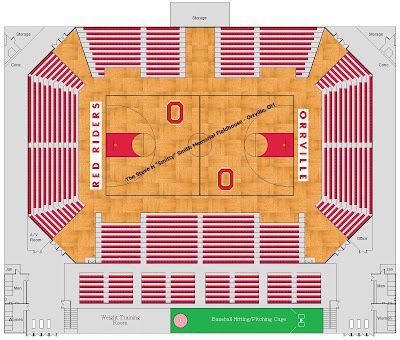 But in the ultimate "what if," let's play a little game called "What if Orrville built a new basketball gym?" First, let me make this perfectly clear.....THIS IS NOT AN ACTUAL PROPOSAL. It is simply for discussion/fun. Secondly, allow me to describe how this came about. I'm a architecture junkie, but can't draw a lick and lack everything it would take to be a competent blogger architect (or, City Planner as George Costanza would have it). I've always appreciated good architecture, especially when it comes to sports arenas. I love hearing about professional, college and high schools building new facilities. I've been a pig in slop this spring with both New York teams opening new baseball parks, The U of Akron (FEAR the ROO!!) continuing to work on their new football field and the new concept of using the entire dome for a NCAA Men's Final Four. Seriously, tell me this isn't an awesome picture. So anyways, a thought came to me last week. What if I started a 2nd blog to highlight new stadiums and stadium upgrades in the NE Ohio area, or all over the country for that matter? Well, after some quick searching, I found that, in one form or another, those all pretty much exist and would just be redundant. Running one tremendous, world-renowned blog can be a lot to keep up with, I'm only human you know. What I did find in my search was a blog run by a man named Terry Schulz that had a bunch of different conceptual stadium drawings. He had a 2nd blog that was created with the sole purpose of proposing a new arena for the NHL's Detroit Red Wings. Check out each site, nothing amateur about it is there? These weren't the kind of scribblings you'd find on a notepad like I used to do in Mrs. Bradley's study hall. Terry obviously has at least a strong interest in architecture, if he's not in the industry itself. I thought I'd float a test balloon his way and attempt to make contact with him, and see if he'd be interested in doing a quick concept drawing for an Orrville gym. Not only did I get a response, but he was willing to give it a go. I fed him all the specifics, names and logos....and what I think would make a great high school gym. If you've read this site at all, you know I'm a sucker for the Canton Fieldhouse, I love everything about it, and think that if Orrville were to ever build a new gym, it should model the Fieldhouse, at least in seating design (2 levels & seating "in the round"), albeit on a smaller scale. Seating on all 4 sides would give our gym a most unique feel, as no other area gym does that, and only Berkey Fieldhouse in Smithville has 2 levels of seating, another important feature. 1. Seating is 2070 on lower level and 384 on upper level (2454 total). Maybe a little big (I think ideal numbers for a school our size is 1200-1600). You could always hack out a section behind each hoop....or just get rid of the 400 upper level seats to trim down the capacity, leaving one level of seats like this. But I don't think 2000 is out of the question. I've always been told that if you're bothering to build anything, make it bigger than you think you'll ever need. You just never know. 2. All lower level seats are retractable, allowing for 2 full length courts to be utilized when seats are retracted. 4. Concession area and concourse would be located above the first level seating, giving the gym a recessed feeling. Much like this gym in New Castle, Indiana. 5. The weight room and baseball batting cages were just a throw in and not specifically requested by me, however, I do think a weight room would be a necessity in a stand-alone facility, and maybe some sort of classroom space as well. I'm sure we could get lost in the details, what logos should be on the floor, what color the key should be, etc. My goal is to communicate the need to make a new gym, if ever built, something unique and special, not just a cookie cutter gym with no heart. Where to build it? A fairly simple question. Build it on the vacant land between the high school parking lot and the football field, the corner of Ella and Mineral Spring streets. You'd still be able to utilize the same parking area and the building would still be a part of the campus environment the district is trying to create. I would hope that at least the court, if not the entire building would be named in memory of Coach Smith. He put Orrville on the map in terms of basketball, and helped stock our trophy cases for 25 years, including 3 state titles and 400+ career wins. Unfortunately, this project as a whole is about as likely as me running a 4 minute mile, and with the all-weather track needing resurfacing, and either a renovation or replacement of the existing high school on the horizon, capital projects will be few and far between over the next 10 years. We certainly can dream though. I'd love to hear your thoughts on what you'd like to see in a new gym, and what you did and didn't like about this proposal. The comment section is wide open. New readers, this is your chance to dip your toe in the pool. I love the idea, it is crazy but I was just talking to a good friend about this topic. I think if it did hold around 2500-3000 Orrville could hold tournament games there. I think you need to get in contact with Bobby Knight I think he could throw a few dead presidents our way. By the way I love this site you are a proud and true Orrville fan. I think Coach Knight has done plenty.....unfortunately, this would probably have to be another private funds project. The community has given a lot lately, so it's probably nothing more than a pipe dream. If we ever build it, we need to make it unique. With a badly needed facility renovation/repair looming on the horizon, what about a layout for what is arguably Orrville's most successful program, Track & Field? Any friends in the design world able to tackle this? Thanks for the comment....track is definately a succesful program for us, but in terms of revenue producing sports, track & all other sports count on football and boys basketball to pay the costs. The sports that produce the revenue are the ones who seem to get the most attention, like it or not. Only the biggest of the big schools in Ohio have separate, track-only facilities. It would be very tough to justify a track-only facility for a school our size.....just the reality of it. I'm sure the money will be raised to renovate the track, but our track surface, even in a below average state, is still leaps better than some schools our same size. Some schools still run on dirt. The recent renovations to the bleachers and sound system benefit the track program just as they benefit the football program. As far as track & field research, I'll cover it when districts and regionals roll around, but not real interested other than that. I am certainly not crazy enough to believe that Orrville could pull off a track only venue, who do we think we are? Jackson? Actually the track comment was geared more towards an overhaul of Red Rider Stadium, from a track and football perspective. A complete overhaul would be nice, but your original comment mentioned only track. Thanks for clarifying. I think the recent upgrade of bleachers on the home side and construction of new bleachers on the visitor side was a considerable upgrade to our stadium...we've also recently upgraded the sound system. The field goal posts are slightly over 10 yrs old and still the best in the area, IMO. They were purchased right around the time Dan Stultz was a senior. 1. New track - which i think is at the top of the list. 2. Field turf - a "want" in the truest sense. Not really necessary, but becoming more and more common. 3. Scoreboard? Another "want." The current one works. So long as it continues to work, we wont see a change in that. 4. Restroom facilities. That could be redone in my opinion. I'd love to see that torn down and a new restroom/locker room facility added. What other changes/upgrades did you have in mind? I agree - the restrooms need a complete overhaul and that should be done ASAP. I would like to see a Projected Cost for the Fieldhouse Concept by someone in the construction field. Secondly, I believe top priority should be the Restroom Facility it contiues to take the luster away from the Stadium as a whole. I also see the potential for another possible high dollar donor before long. If he can make it to the bigtime "T.H." Orrville is on the up and up. Smuckers is doing well which always takes interest in our Community. With the renovation of the high school about to happen, there has been talk of moving the cafeteria to the front of the building and expanding the seating area at b-ball games with movable bleachers and combining those spaces in some way. I think the admin. is looking at that now. Yes, I saw that in the paper and it's very intriguing to say the least. It certainly is landlocked in it's present form but the article said they want to make the floor 94 ft long instead of 84 feet that it is currently...that means on one end of the gym, they're planning to expand. Any extra seats in the gym is a plus. Wonder if the new gym with have any of these features. Great that OHS will finally have a true compettion size gym after decades of OHS basketball being played in the Old OHS basement gym and the current undersized gym. Smuckers seems to be interested more in donating to academic related functions, band, Choir, Arts, new college academy. Hard to say at Orrville wether sports or academic functions pay the most dividends in life for graduates. Sports experience given tradition, plays a huge role in shaping OHS grads. Glad the district is making strounger focus on academics something a school district should really be known for overall. I think a healthy balance of athletics and academics is all any school district can ask for. Not every student will excel in academics, same with athletics...so to say one or the other pays the most dividends is tough. A strong education prepares students for the next stage in life, and athletics fosters competition & team play which will also be used the rest of their lives. Smuckers stepped up and paid for half of the multi purpose stadium, so their impact on the school district isn't limited to just academics. In my peronal opinion sports is an extra activity that hopefully helps to mold kids into well rounded adults. As well as providing them an alternative acitivity that is vital in a small community. But academics are key in future success of individuals unless you are a stellar athlete that can make the big time Proffessional sports of which OHS has only produced one or two to my knowledge. Think its awesome smuckers is donating to multiple causes sports, academics, and the arts. A school districts reputation is built on both Academics and Sports but the reputation I think a school district should desire and strive for is a Great academic institution that prepares students for anything they want to become.